There’s nothing quite as annoying as stepping into the shower only to have cold water fall down on you or a slight trickle instead of a strong, steady flow. If you are dealing with water pressure or temperature issues, you may have a broken shower valve that needs to be replaced and as the best shower valve installation and repair company in San Diego, we can take care of those issues. Shower valves are responsible for adjusting the water temperature, controlling the pressure, and diverting the water from the tap to the shower head. When they begin to wear down, they can have difficulty functioning properly. 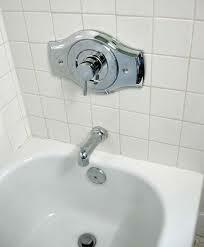 At Plumbing and Drains Solutions, we offer comprehensive shower valve services. Having problems with your shower valve? Call us at (619) 345-5550 to schedule prompt plumbing services in San Diego. Taking a shower while having to deal with low water pressure, insufficient hot water, or other problems can be incredibly annoying. If you are having difficulty with your shower that you’ve been unable to resolve with basic troubleshooting, it may be time to bring in professional help. While replacing your shower valve by yourself may seem tempting, the installation process is quite complex. Our plumbers are trained to diagnose and fix all types of shower valve issues. With nearly a decade of experience in the field, our licensed, bonded, and insured plumbers can handle any type of shower valve problem you may be having. Once we have found the source of the problem causing issues with your shower, as the best shower valve installation and repair company in San Diego we can offer our recommendations. This may involve making repairs to your current equipment or replacing your shower valve altogether. We even offer 24/7 repair services for emergencies. Call us today for a plumbing service estimate from San Diego’s top rated plumbers. Request a free estimate on our shower valve services in San Diego. Contact Plumbing and Drains Solutions at (619) 345-5550 today!